As the year draws to a close, all those involved with the musical production "Nanta" can reflect on how they will remember 2003 for the rest of their lives. Created by Song Seung-Whan, a well-known television actor, in 1997, the show has been thrilling audiences in Korea for almost six years. 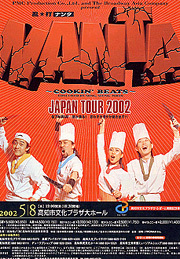 The unorthodox combination of cooking and high-energy percussion has also come to capture the imagination of people all over the world. It has been performed over 38,000 times in 15 different countries. Since its inception an estimated 1.5 million people worldwide have seen the show, with total receipts of over 25 billion Won ($21 million). However this past fall the group made it all the way to the biggest stage of them all. Nanta became the first Asian commercial musical in history to debut on Broadway. It's safe to say most people if asked to freely associate mega-musicals with countries of the world, would probably leave Korea inconspicuously absent. That may soon change however, leaving one to wonder how Nanta made it all the way to the top. The way most people make it to the top of anything, with a lot of hard work and a little bit of luck. "Things really took off for us after we did the Edinburgh (International) Festival in 1999. The word spread about our show and the right people started talking about us," says B. I. Kim, who functions as the group's public relations officer, interpreter, and whatever-needs-to-be-done in English handyman. In the summer of 2002 the director of the New Victory Theatre on Broadway came to see us here in Seoul. She liked what she saw and a year later there we were." But what enabled Nanta to succeed where others have failed, and saw it become a pioneer for Asian productions trying to break into the lucrative international market? A big factor is that it's basically a non-verbal performance. That removes the language barrier, which can be very difficult to overcome for many shows from this part of the world. "Our show has most people leaving very happy. It doesn't matter where in the world they watch it. It's a fun few hours, everybody loves rhythms and more importantly the show's subject is food. Everybody understands food," says Mr. Kim. By all accounts the group had a blast during their time in New York. A month of sold out shows and nothing but positive reviews from some of New York's most influential press. They also did the morning talk show rounds, which saw Mr. Kim trading barbs with the likes of Al Roaper and Regis Philmon on American national TV. Not to mention the celebrity guests that needed welcoming. Kevin Kline and wife Phoebe Cates were spotted in the audience one night, another saw Marcia Gay Harden from "Pollock" fame attending the show. A name more recognizable on local shores, Pak Chun-Ho, also managed to catch the show while he was in New York. So where do you take your show after Broadway? London's West End pops to mind, but that's more a matter of course now than an actual goal claims Mr. Kim. "We were approached by a promoter while in New York and it looks like we'll do a national tour of the USA and Canada next year," says Mr. Kim proudly. "Our other goal is to land a long-term gig in an off-Broadway theatre. If we're successful it's possible to run the show a long, lone time there." The difference between off-Broadway and Broadway has become rather blurred anyways. It used to be that simple geographic location dictated whether or not a show was on or off. Nowadays that term is more determined by theatre size than anything else. A show can literally open right in the middle of Broadway as Nanta did but still be technically off Broadway if it's a sufficiently small theatre. Of course at this point it's just a matter of semantics and should not take anything away from what everyone involved with Nanta has achieved this past year. The group may never be mentioned in the same breath as CATS, but they have blazed a trail that many stage shows from this part of the world will look at not only with envy but also with an eye to repeating.